"Without a doubt, my favorite Christmas tradition is to celebrate Jesus’ birth by hosting a Birthday Party for Jesus for my 5 precious grandchildren, ages 4 to 12. It is a tradition that I started with my children more than 30 years ago, and have reinstated with my 5 “littles”. This year will be our 3rd Annual celebration. At the birthday party we have games, crafts, gifts and of course, a birthday cake for Jesus. It’s a wonderful way to focus on the “real reason for the season”. Last year we added rehearsing for the Christmas pageant that we put on for their parents on Christmas day. This is a tradition I hope to continue for many years and hope that my “littles” will pass it on to the next generation." "About 5 years ago my wife Heather and I began the tradition of having her mother and father decorate our holiday cakes with us. Heather makes the cakes from scratch and then her mother Charlene and father Bill take on the role of skillfully frosting the cakes. Pictured is this past year’s Thanksgiving cake as well as a picture of Bill frosting last year’s Christmas cake. (Bill will turn 90 this coming December 20th!) Bill always seems to manage to have an extra spoon-full or two of frosting left over in the bowl that is his special reward for a job well done!" - Mark Iverson, VP of Community Operations, Immanuel Home Office. "I was fortunate to grow up in a family where every year Santa came and visited us all. Every Christmas at my grandparent’s home near Arcadia, NE we would all gather in their farmhouse. This gathering included multiple Aunts and Uncles as well as cousins numbering close to twenty. After dinner the anticipation for Santa’s arrival would begin. We would begin to gather and ask, “Is Santa coming this year?” My Grandma would usually say something about Santa not knowing when to come until we started singing. So we would sit in the living room, dining room, and throughout the old farmhouse and begin to sing some Christmas carols. Usually, Santa would make his grand appearance during a rousing chorus of “Jingle Bells”. We would all sit on Santa’s knee and give him our requests and take pictures with him. Then, just like that, he would leave singing a Christmas carol. One year during Christmas, as about an eight year old or so, I and my fellow cousins were playing on a huge pile of snow outside the house. The snow had been piled there by a tractor after a very snowy winter. We were playing a game called: King of the Mountain. It was a little bit rough and tumble, but a fun way for us to play in the winter. I will never forget sitting on that mountain of snow when something caught my eye. From my elevated angle, I could barely see inside of the small bathroom window of the farmhouse but what I saw will not be forgotten. There was a man that looked a lot like my Uncle Fred putting on a crushed red velvet suit and donning a curly white wig. I rushed inside to tell my mom what I had seen. As I approached her, her eyes told me all I needed to know – be quiet about it! There were many younger cousins inside. 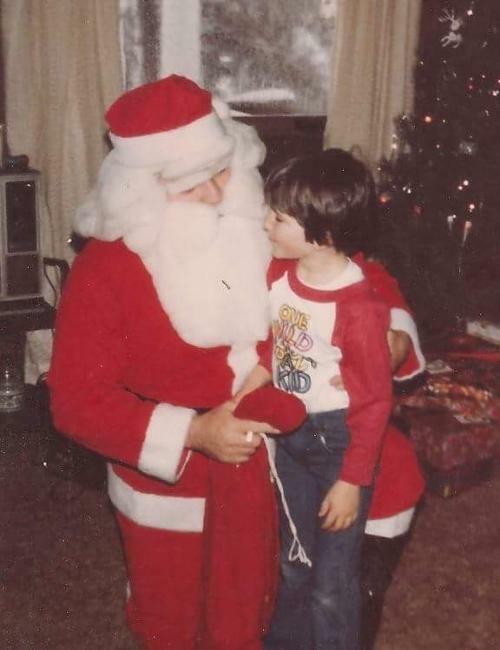 I remember looking at Santa a little different that Christmas as he came lumbering into the living room. I was inspecting, looking for signs of my Uncle Fred. There were similarities to be sure. Of course, following that Christmas my mom filled me in a little about the magic of Christmas and Santa’s helpers and the like. One phrase I won’t forget she said: “If you don’t believe in Santa, he won’t come.” Or as I recently told my 11 year old son: “If you want to receive, you have to believe.” My mom’s message was loud and clear! One of my favorite lines from The Polar Express is when the conductor wisely says: 'Seeing is believing, but sometimes the most real things in the world are the things we can't see.' There is so much truth in that line!" "My favorite memories are spending Christmas Eve with my Dad’s side of the family. Every year we have a theme to the type of food we are supposed to bring. We have done everything from French food to bringing food related to a favorite Christmas carol. One of the photos is of my grandpa when we celebrated with Danish food, sadly he passed away 2 weeks later but he was beaming the entire night as he ate some of his favorite foods. 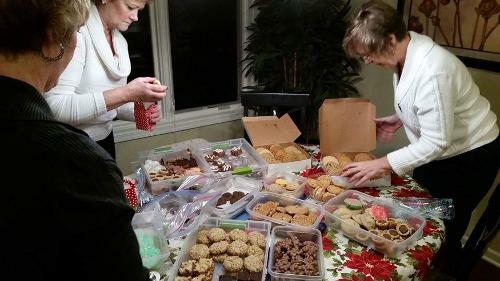 We also bring cookies to put together plates that are then taken to local hospitals, assisted living, long term care communities in the Lincoln area. The residents/patients are always so happy to see my aunts on Christmas day not to mention we have a lot of good bakers in my family. The last part of our Christmas Eve tradition is singing Christmas carols. The last song is always Silent Night and the family holds hands and walks around in a circle while singing." "I am the oldest of 9 and Christmas growing up was always chaotic and amazing. We opened wrapped gifts Christmas Eve and then walked to Midnight Mass. Our dad was both the lector and sang solo on ‘O Holy Night’ from the altar—still my favorite Christmas carol. Christmas morning we woke up to unwrapped gifts from Santa, each of us with our own special pile! We somehow instinctively knew which ones belonged to each of us. Looking back, I’m sure Mom and Dad didn’t sleep at all that night, getting everything ready! 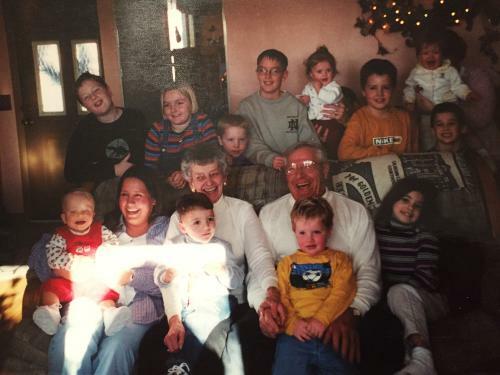 This photo is of Mom & Dad and 13 of their 16 grandkids. The look on their faces says it all!" "My family’s tradition is a sad one, but brings us great joy. I had a baby who died when she was 17 days old. Her brother who was 18 months old when she died was worried at Christmas that his baby sister did not have a doll in heaven. Nothing would convince him that she did not need one. So we bought her a doll and placed it on her grave. Of course you can imagine what happened. It was stolen. So my answer to him was that there was probably another little girl that needed that doll which was more than enough explanation for a 2-year-old. The following year he wanted to buy a doll for his sister and we discussed how some children did not have much so they probably would not get a doll for Christmas. We also saw a commercial on television about Toys for Tots. So we drove to Wichita which was about 30 miles from our home to give them the doll. When my son put the doll in the container he told the Marines why we were doing it. From that moment on, every Christmas we give a doll to Toys for Tots. This effort has now grown to 15 dolls as each one of my family members got older they would pick up our tradition. So this year, two more dolls will be added so now my family and extended family give 17 dolls to charity at Christmas time. Some dolls go to Toys for Tots and others go to different community charities in our area." “When I was 9 years old I went and stayed with my great aunt Helen that ran a dog kennel. It was my birthday so she gave me a Beagle puppy that she wouldn’t be able to sell. We named him Duke. We went everywhere together on the farm. We swam together, we played ball together, even went to bed at night together. About November I came home from school and I knew something was wrong right away when Duke didn’t meet me as I got off the bus. Duke was gone. We searched for him high and low. We put out fliers. We called the local vets….no Duke. As Christmas got closer and the days got colder I couldn’t help but look for Duke every day. I would look for Duke in the fields as I was going down the road on the school bus. I would holler for him every night “just in case” he could hear me. On the night of December 23rd my Dad was tucking me into bed and I said “Daddy, do you think Duke will make it home for Christmas?” And he said “I bet if you pray really hard he will.” So I did just that. I prayed ALL NIGHT LONG!! I told God that if he would just bring Dukey Boy home for Christmas that I would be good. I would do all my chores without complaining. I would be nice to my sisters and most importantly that I would never, ever ask for anything again.